NEW YORK MILLS, Minn. – April is National Donate Life Month, something that is near and dear to the Koehlers. This June, Justin Koehler will be celebrating a decade of a successful kidney transplant. 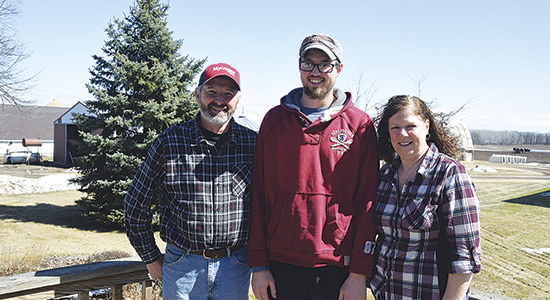 Justin operates a 400-cow dairy with his parents, Roy and Ronda, and brother, Matt, near New York Mills, Minn. In 2008, Justin was gearing up for his first kidney transplant after being diagnosed with Membranoproliferative Glomerunlonephritits (MPGN). MPGN is a disease that affects the filters of the kidneys. The filters become plugged and could no longer filter waste from the blood. When Justin went in for the diagnosis, he had 19% kidney function. Without a transplant, he would lose both his kidneys and need dialysis. Soon after his diagnosis, Ronda was quick to volunteer as a donor. After multiple tests, she was informed she only had one functioning kidney, due to a childhood infection, and was not able to donate to her son. That is when Roy decided to be tested. “We had to start all over with the testing, and I ended up passing it all,” Roy said. With all the boxes checked, Roy and Justin went into surgery. Typically the transplant surgery is more difficult on the donor. After three days, Roy felt better. He and his family waited for Justin to be cleared so they could go home. Justin was doing well after the surgery, eating and drinking normally. Then, five days post-op, Justin lost the kidney. It was a tough day for everyone involved. Family at home was concerned and shared in the Koehlers’ anguish over the failed procedure. “I called home crying to my sister and right away she said, ‘Doug’s right here, and he said he’s next,’” Ronda said. Doug Harthan is Justin’s uncle, and a local paramedic. He already knew he was the same blood type and was up for the responsibility. Justin, Ronda and Roy went home defeated, and Justin started dialysis three months later. But the family rallied together, joining Justin on his strict renal diet. The mutual support within the family and the community helped them all stay focused on healing. In the spring of 2008, Matt and neighbors pitched in to help get the Koehlers’ crop in the ground because both Justin and Roy were laid up. The community also organized a fundraiser and benefit for Justin before the first transplant. The remainder of 2008, and half of 2009, Justin was on dialysis and went through more tests to find why his blood had clotted and how to move forward. On June 25, 2009, Justin underwent his second transplant surgery. This one was successful. Since then, Justin has been mostly healthy. He had a scare in 2013 when he needed to be treated for signs of the disease coming back. That was easily managed at the hospital in Fargo, N.D. Since then, he has lived a normal life. “We’ve been through a lot and couldn’t have made it without blood donations and other efforts from the hospital,” Ronda said. Justin still travels to Rochester twice a year for blood work and a check up and will take anti-rejection medication for the rest of his life. Often people are not aware of the impact organ donation can have on their community, whether that is local or industrial. Simply by checking a box on a driver’s license renewal could save a life.